…of Hope to Our Planet. “Lágrimas que son semillas de Esperanza para Nuestro Planeta”. Este es el boceto limpio que he comenzado a pintar en acuarela. This is the clean sketch. A new watercolor I am working on. I will be finishing this one this week. I am glad I am back painting, facing all those fears that were holding me back from painting again. Heating my motors. Plus preparing myself to paint a 3D figure named: “Mellow” for Nick. I will share more sketches during the week. I will be painting them one after another. For you and me. Enjoy the process. Remember this Journey with Me. With ♥ always. Meanwhile enjoy this fantastic Video. I posted it on Facebook, welcoming Year 2012! Un Buen Viernes, Viernes Santo actualizando mi blog. Como les prometí, trataré de actualizar mi blog de 2 a 3 veces por semana. 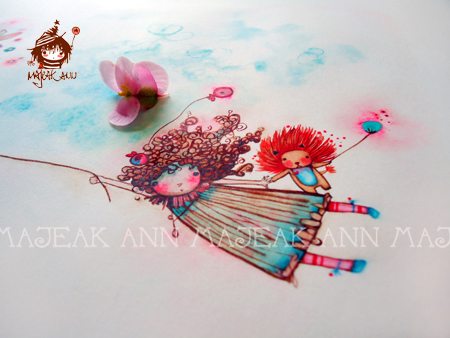 Recuerden seguirme en Facebook en: Majeak ann Illustration. Que estos bocetillos les brinden Paz. A Good Friday for you. As I promised, I am going to try 2 or 3 times a week. Please, say hi! Feed the Blog. 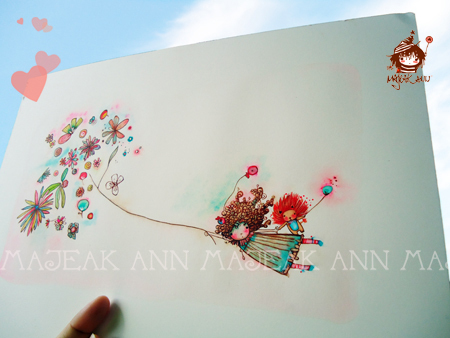 Remember to follow me on Facebook here: Majeak Ann Illustration. May these doodles brings you Peace and Joy. ¡Hola a todos mis amigos lectores! ¡Bienvenidos Todos/as! Gracias por regresar siempre. He regresado. Estoy de vuelta después de una larga pausa. Explorando nuevas posibilidades. Retomando nuevamente el timón artístico. ¡He vuelto a pintar! De regreso con la técnica “vieja escuela/old school” de acuarela. Para que no se pierda la esencia del pincel y el tacto. Arriba les comparto una ilustración (acuarela) terminada. Si desean ver el proceso creativo, pulse aquí para verlo. Voy a hacer todo lo posible para actualizar mi blog semanalmente. Así que los veo de vuelta. ¡Que lo disfruten! Con amor ♥ májiko. Hello! Welcome and thank you for always coming back my friends! Here I have returned after a long pause. I am currently exploring new possibilities. I am painting again! I am sharing my sweet return with a watercolor I did. Perfect for this week Illustration Friday‘s theme: Return. I am back using “old school” technique. So I don’t loose the essence and the touch that only a paper, pencil or brush can do. If you would like to see the whole process of this painting, click here. Have a peaceful week. With “majeakal” ♥ always. P.S. 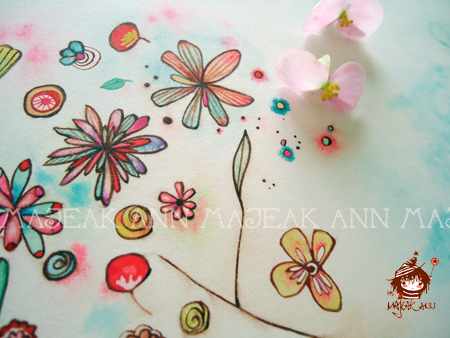 Please, remember to be part of “Majeak Ann Illustration” Facebook Fan page. I usually post there First! And remember to Share the page with your friends! Thank You! Please, say Hi!